Keep comfortable at a picnic and show your patriotism with these American Flag cushions from Lily Sugar n' Cream. 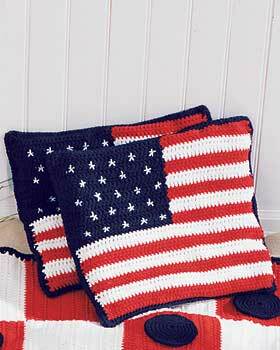 This festive crochet pattern is also great for decorating your home on the 4th of July. To make the red and white afghan pictured in this image, see the Checkers Game Afghan Crochet Pattern. Yarn: Lily® Sugar’n Cream® (70.9 g / 2.5 oz) Quantity for 4 cushions. Size: Approx 16 ins [40.5 cm] square. Gauge: 13 dc and 7 rows = 4 ins [10 cm]. Note: Ch 3 at beg of row counts as dc. To change color, work to last 2 loops on hook at end of row. With new color, draw through 2 loops on hook, then proceed. FRONT (make 4): With A, ch 54. 1st row: 1 dc in 4th ch from hook (counts as 2 dc). 1 dc in each ch to end of ch. Turn. 52 dc. 2nd row: Ch 3. 1 dc in each dc to end of row. Join B. Turn. 3rd and 4th rows: With B, as 2nd row. Join A at end of 4th row. Turn. 5th and 6th rows: With A, as 2nd row. Join B at end of 6th row. Rep last 4 rows once more, then 3rd and 4th rows once. 13th row: With A, ch 3. 1 dc in each of next 26 dc. With C, 1 dc in each dc to end of row. Turn. 14th row: With C, ch 3. 1 dc in each of next 24 dc. With A, 1 dc in each dc to end of row. Join B. Turn. 15th row: With B, ch 3. 1 dc in each of next 26 dc. With C, 1 dc in each dc to end of row. Turn. 16th row: With C, ch 3. 1 dc in each of next 24 dc. With B, 1 dc in each dc to end of row. Join A. Turn. Rep last 4 rows twice more, then 13th and 14th rows once, omitting color change at end of 14th row. Fasten off. With RS facing, join C with sl st to any corner of Front. Ch 1. Work in sc around 4 sides of Front, having 3 sc in corners. Join with sl st to first sc. Fasten off. BACK (make 4): With C, ch 54. 2nd row: Ch 3. 1 dc in each dc to end of row. Turn. Rep last row until Back measures same length as Front. Fasten off. With RS facing, join C with sl st to any corner of Back. Ch 1. Work in sc around 4 sides of Back, having 3 sc in corners. Join with sl st to first sc. Fasten off. With WS of Front and Back tog, join C with sl st to any corner. Working through both thicknesses, work in sc around 3 sides of Cushion, having 3 sc in corners. Insert foam piece. Work in sc across 4th side of cushion closed. Join with sl st in first sc. This flag cushion is such a great idea. It is the perfect pattern to show your patriotism. I am seeing comments regarding the stars and how to make them. I am curious also, since it has been said to follow the pattern for the front and the stars will be there. I do not agree with this, because you would make a stitch with color A between color C stitches, I think, and this is not in the pattern. Hi there! I looked for the original pattern from Yarnspirations and wasn't able to find it to compare. I imagine you could embroider the stars over the blue background when finished! This is a really helpful video from Moogly on how to do that: https://www.youtube.com/watch?v=EJ8FI5PJfvk Good luck! Yes, we like flags, but if one has been taught the etiquette of the flag, we don't use it for cushions, rugs, afghans, etc. since it like sitting on, or standing on, or wrapping up in, or in other words, disrespecting the flag. If you know someone in the military they will tell you they can't even wear it on hats, etc. We love our country and respect the flag and I don't think anyone is meaning any harm, they just don't understand the reason behind it. However, you can use the red, white, and blue color theme in many ways. I don't find it disrespectful at all, the more flags the better!! :) But, I must be missing something somewhere in this pattern.....what about the stars? Yes I am making this right now and there is nothing about making the stars. It's a good thing that I am a crafty person and can figure it out. Where are the stars??? did anyone find out about the whereabouts of the stars? Love your crafts, but I object to using the American flag as cushions, placemats, afghans, plates, etc. It seems disrespectful to me.